Recently I’ve built a cool new Corne keyboard, and I’d like to share the build process with you guys! This build was a bit of experimental. I didn’t want to solder switches as I wanted to try a few different types. And ProMicro – I decided to make it socketed so I could change the controller if I need to. 64-pos Mill-Max socket row. Used for Elite-C and OLED display socketing. One row is enough for the build. Mill-Max pins. Will be soldered to Elite-C. You need 48 (12×4) but get some extra just in case. 64-pos Mill-Max connector. This two-sided connector will be soldered to OLED displays. I used 64 pos but only 8 (4×2) pos are needed for OLEDs. You can get something like this instead. The original build guide was created by foostan, and that was the source that I used. I’d like to highlight the socketing part only, as all other steps are the same as in the original build guide. I decided to use Mill-Max low-profile sockets for ProMicro. I’d need one 48-pos row cut by 4 parts to get 4×12-pos rows for two ProMicros. But it’s always a good idea to get some extra just in case, so I ordered the 64-pos row on DigiKey. The ProMicro doesn’t have any pins pre-soldered out of the box, so we also need 48 Mill-Max pins for it. The OLEDs come with the already pre-soldered standard connector. That one is not compatible with Mill-Max sockets. The easiest way to attach OLEDs with the standard connector is just to get these sockets and solder them in place. Sockets are shown on the picture above – between TRRS connector and Elite-C.
That would work just fine, but OLED height will be a bit bigger than I’d want to. So I didn’t use this approach. The Mill-Max 2-sided connector on the left and the original on the right. 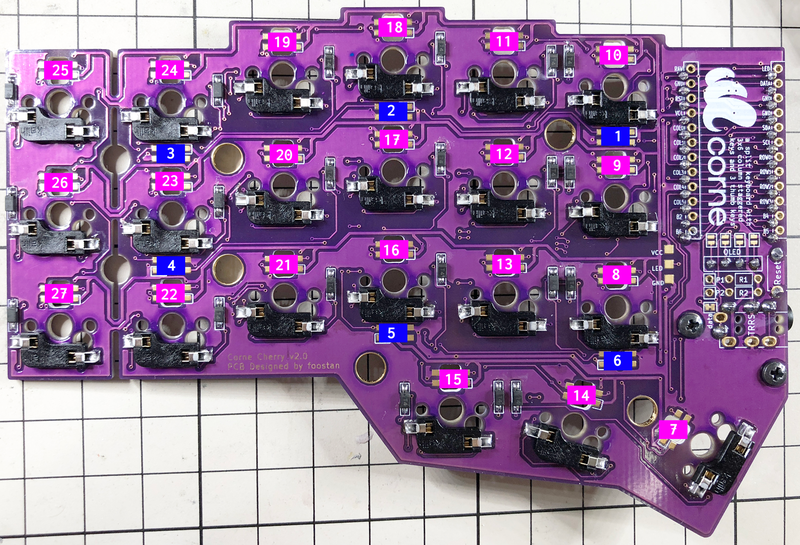 All sockets, pins, and connectors are soldered. Make sure you set the soldering iron temperature to ~420F -430F. LEDs are too heat sensitive! All LEDs are chained so if the very first (facing down) is broken you won’t see other light up. If the very first one lights up, solder the second one and test again. If the second doesn’t work you have to check two places – output from the first LED and all joints on the second. The same for every following LED. I used Zealios V2 switches for the build. I’m looking for a good tactile non-clicky switch and hope these will work fine! Hope this helps if you just starting the Corne build! If you have any ideas on how to improve the process, please let me know in the comments! This entry was posted in Corne, CrKbd, Keyboard, Mechanical Keyboard. Bookmark the permalink.